This map shows the Salmon Run route and surrounding area.The Salmon Run follows the 54 miles of National Route 77 as it follows the winding course of the River Tay between Dundee and Pitlochry. The Tay is Scotland's mightiest river, and the longest at 120 miles. It is famous the world over for the quality its record-breaking salmon. For most of the way the route uses quiet country lanes and dedicated cycle paths, but with a few short off-road sections.Full colour map based on Ordnance Survey data with easy to read contours and route profiles. 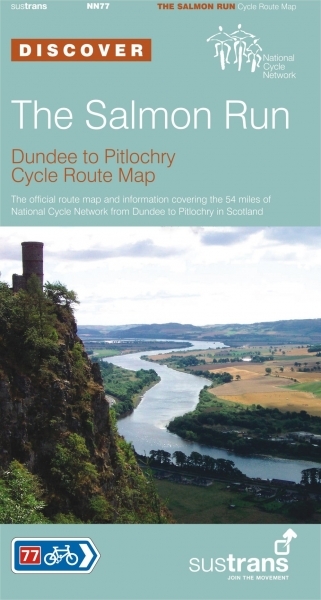 Also features detailed inset maps for the major towns and cities and 5 circular routes of 11 to 22 miles length, which are recommended for exploring the area in more depth.